Total income in FY12 was Rs7.3mn, with substantial contribution from Government to the tune Rs30mn comprising of 73% of total income (sector average: 21%). ONGC is their only contributor in Government sector. Individual donations contribute to about 20% of total income in FY12 (sector average: 43%). DEAN Foundation receives funds from corporates as well. However, as the amount of corporate donations cannot be quantified separately, all donations have been considered as Individual donations. Donations from Idhayangal Foundation, UK have led to a sharp increase in foreign donations from Rs92,000 in FY10 to Rs0.4mn in FY11 and FY12. However this still contributes only 5% of total income. Sales and Sponsorship income comprises of proceeds from sale of scrap. 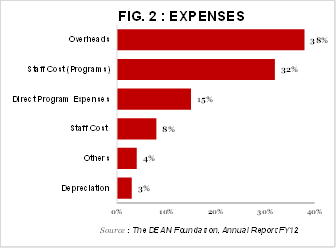 Expenses in FY12 totaled to Rs7.4mn with 47% pertaining to direct program expenses. Though the direct program expenses do not constitute major proportion of the total expenses, they are in line with the sector average of 51%. Indirect expenses accounting for the balance are in the nature of travel expenses, depreciation and other overhead expenses such as rent, electricity charges, interest and fuel charges to name a few. Staff cost related to programmes has increased from Rs0.90mn in FY10 to Rs2.35mn in FY12. This can be attributed to cost incurred for retaining the existing staff. Professional fees have decreased from Rs20,000 in FY10 to Rs330 in FY12. Fees for FY12 have not been accounted for during the year and would be paid in FY13. Cash and Bank has increased by about 7x from 0.2mn in FY11 to 1.3mn in FY12. This is on account of the donations received for the purchase of vehicle deposited in bank. DEAN Foundation has a dedicated staff of 42 including two full time doctors, one part time doctor, four nurses, two administrative officers, three drivers and other essential staff. DEAN Foundation treated 1,277 patients in FY12 including 1,005 cancer patients and 272 patients suffering from other illness. There is negative income growth of 3.4% in FY12 as compared to the growth of 52% in FY11. This can be attributed to donations received in kind being written off in FY12. 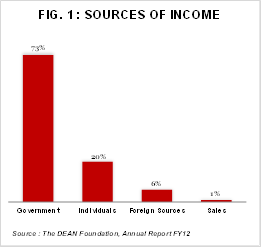 The self-sufficiency ratio is at 0.2x (ratio measures how much of expenses can be met from own income – individual donations/corpus income/fee income) as major source of income is from Government sources. The repayment capacity ratio is 1x. This Indicates ratio of own funds to total borrowings. Own funds include corpus funds and accumulated funds and excludes unrestricted funds. All of DEAN Foundation’s borrowed funds are from its own members (Rs3mn) and account for 40% of total funds in FY12. Non availability of Medical professionals due to non lucrative nature of work. High attrition of already trained medical and non-medical staff. Lack of funds for an inpatient hospitality centre. Reluctance of owners to let out premises on rent for such ailing patients. Late referrals making it difficult to enhance the quality of life left. Non acceptance of the concept of professional care for terminally ill, aiming at quality end of life days, by a large majority of Indians.